With climate change, water will become an overall more precious and precarious resource in Manitoba. 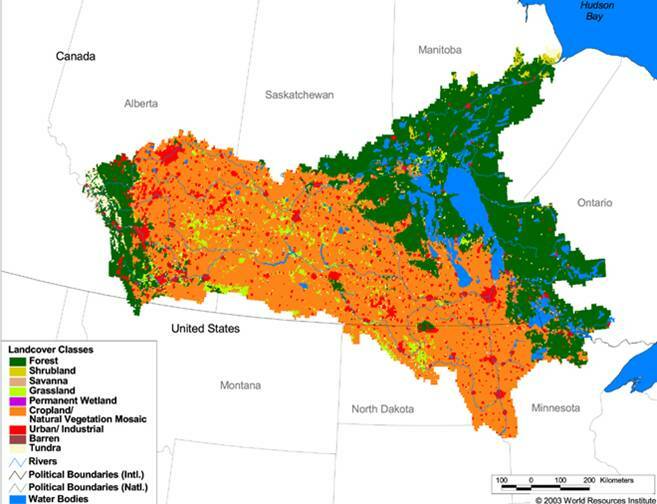 Water scarcity has always been a concern on Canada’s Prairies. In the mid 1800s Captain John Palliser identified the Western Canadian Prairies (the “Palliser Triangle”) as an arid region unsuitable for settled cultivation, in which disaster would befall those who tried to settle it (1). Most computer models project a slight to no increase in average total annual precipitation this century (2). However, it is most likely that the timing and nature of the precipitation will change. Results of these changes include lower summer stream flows, falling lake levels, retreating glaciers, and increasing soil- and surface-water deficits. A trend of this increased dryness will most likely be realized through a greater frequency of dry years especially in Manitoba’s southwest. (9) Drier soils over time will lower the ground-water tables. Less water will also threaten the quality of what remains in the rivers, lakes and ponds. To explore the changes in precipitation for Manitoba and the rest of Canada, try the Prairie Climate Centre‘s interactive map tool, found here. Droughts would further impact Manitobans due to our reliance on water for electricity production. Since most of our hydroelectricity comes from the Nelson River, we are also very dependent upon Rocky Mountain glaciers and snowpack. Both of which are threatened. Figure 1 shows a map of the Nelson River watershed. An example of Manitoba Hydro’s dependence on these water sources can be seen in the drought year 1988. Manitoba experienced only a 4% decrease in hydroelectric power generation compared to normal years. However, this resulted in a 72.6% drop in export sales from the previous year and a net income loss of $26.4 million (10). In 2004, Manitoba Hydro again posted a net loss – this time for $436 million. And again, this loss was primarily due to the prolonged drought conditions of 2003 (11).